Red pencil urchin – Papahānaumokuākea. Photo courtesy USFWS. The islands included in the monument are all part of the State of Hawaii, except Midway Atoll, which is part of The United States Minor Outlying Islands insular area. Henderson Field, on Midway Atoll, provides aerial access to the monument. The monument's ocean area is administered by the National Oceanic and Atmospheric Administration (NOAA). 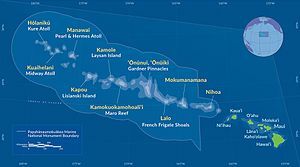 It also contains within it a number of U.S. and Hawaiian designated refuges, sanctuaries, reserves and memorials with their own specialized administration. About 132,000 square miles (340,000 km2) of the monument were already part of the Northwestern Hawaiian Islands Coral Reef Ecosystem Reserve, which was designated in 2000. The monument also includes the Midway Atoll National Wildlife Refuge (590,991.50 acres (2,391.7 km2))  and Battle of Midway National Memorial, the Hawaii State Seabird Sanctuary at Kure Atoll, and the Northwestern Hawaiian Islands State Marine Refuge. On January 30, 2008, the U.S. Department of Interior added the monument to a tentative list of 14 proposed sites for consideration on the UNESCO World Heritage List. The Federal Interagency Panel for World Heritage officially accepted the recommendation in November 2008. As a mixed site with natural and cultural resources, the International Union for the Conservation of Nature (IUCN) commented on the natural features of the monument, and the International Council on Monuments and Sites (ICOMOS) assessed its cultural aspects. On August 3, 2015, divers found the wreck of the USNS Mission San Miguel (T-AO-129) within the monument. She had sunk there on October 8, 1957 when she ran aground on Maro Reef while running at full speed and in ballast. Researchers will map and study the wreck in situ. ^ a b Barnett, Cynthia (August 26, 2016). "Hawaii Is Now Home to an Ocean Reserve Twice the Size of Texas". National Geographic. Retrieved August 26, 2016. ^ "Learn to pronounce Papahānaumokuākea". papahanaumokuakea.gov. February 27, 2007. Retrieved May 17, 2017. ^ a b "Bush creates new marine sanctuary". Americas. BBC News. June 15, 2006. Retrieved August 25, 2008. ^ "Lobster fishery remains battered". Honolulu Advertiser. June 19, 2006. Retrieved August 30, 2009. ^ Polovina, Jeffrey J. (2005). "Climate variation, regime shifts, and implications for sustainable fisheries" (PDF). Bulletin of Marine Science. Miami, Florida: Rosenstiel School of Marine and Atmospheric Science, University of Miami. 76 (2): 233–244. ISSN 0007-4977. Archived from the original (PDF) on June 24, 2006. Retrieved August 25, 2008. ^ Reichert, Joshua; Theodore Roosevelt IV (June 15, 2006). "Treasure Islands". Opinion. The New York Times. Retrieved August 25, 2008. ^ Rohmann, S. O.; J. J. Hayes; R. C. Newhall; M. E. Monaco; R. W. Grigg (November 2005). "The area of potential shallow-water tropical and subtropical coral ecosystems in the United States". Coral Reefs. Berlin: Springer. 24 (3): 370–383. doi: 10.1007/s00338-005-0014-4. ^ a b System, National Wildlife Refuge (September 30, 2007). "Lands Report - National Wildlife Refuge System". fws.gov. Retrieved September 3, 2016. ^ "Bush creates world's biggest ocean preserve". U.S. news / Environment. MSNBC. June 15, 2006. Archived from the original on November 8, 2012. Retrieved August 25, 2008. ^ "Northwestern Hawaiian Islands Proclaimed a National Monument". Environment News Service. June 15, 2006. Retrieved August 25, 2008. ^ "Northwestern Hawaiian Islands Marine National Monument: A Citizen's Guide" (PDF). NOAA, USFWS, DLNR. 2005. Archived from the original (PDF) on September 10, 2008. Retrieved August 26, 2008. ^ National Marine Sanctuaries Act of 2000 Archived June 14, 2006, at the Wayback Machine, which became Public Law 106-513 on November 13, 2000. ^ "Designation". Management. NOAA. June 17, 2006. Archived from the original on July 6, 2008. Retrieved August 26, 2008. ^ "President Sets Aside Largest Marine Conservation Area on Earth (Story 2644)" (Press release). NOAA Magazine. June 15, 2006. Retrieved August 25, 2008. ^ "President Bush Establishes Northwestern Hawaiian Islands National Monument" (Press release). Office of the Press Secretary. June 15, 2006. Retrieved August 26, 2008. ^ Weiss, Kenneth (June 15, 2006). "Turnaround as Bush creates huge aquatic Eden". Los Angeles Times. The Sydney Morning Herald. Retrieved August 26, 2008. ^ "Jean-Michel Cousteau: Ocean Adventures". Voyage to Kure. KQED-TV. 2006. Retrieved August 26, 2008. ^ Revkin, Andrew C. (June 15, 2006). "Bush Plans Vast Protected Sea Area in Hawaii". Environment. The New York Times. Retrieved August 28, 2008. ^ Connaughton, Jim (June 20, 2006). "Ask the White House". Interact. Whitehouse.gov. Retrieved August 26, 2008. ^ Jeffrey Brown (moderator); Jean-Michel Cousteau (guest); Joshua Reichert (guest) (June 15, 2006). "President Bush Declares National Monument in Hawaii". The NewsHour with Jim Lehrer. NewsHour Hawaii June 16, 2006. ^ "Federal Fishery Managers Address Impact of NWHI Monument on Bottomfish Fishery and Research throughout Hawaii Archipelago" (PDF) (Press release). Western Pacific Regional Fishery Management Council. October 18, 2006. Retrieved August 26, 2008. ^ "NWHI Fisheries and Ecosystem Protection Have and Can Co-Exist" (PDF) (Press release). Western Pacific Regional Fishery Management Council. May 15, 2006. Retrieved August 26, 2008. ^ "Response to questions concerning Hawaii's bottomfish populations" (PDF). NOAA Pacific Islands Fisheries Science Center. October 27, 2005. Retrieved August 26, 2008. ^ "Pacific Islands Fisheries Science Center response to questions concerning Hawaii's bottomfish and seamount groundfish populations" (PDF). NOAA Pacific Islands Fisheries Science Center. October 24, 2005. Archived from the original (PDF) on June 25, 2008. Retrieved August 26, 2008. ^ "Proposed Northwestern Hawaiian Islands National Marine Sanctuary" (PDF). NOAA. September 20, 2004. Archived from the original (PDF) on September 10, 2008. Retrieved August 26, 2008. ^ "Amending Proclamation 8031 of June 15, 2006, To Read, "Establishment of the Papahānaumokuāke Marine National Monument" (PDF) (Press release). Office of the Press Secretary. March 2, 2007. Retrieved August 28, 2008. ^ Nakaso, Dan (March 3, 2007). "Papahanaumokuakea new monument name". The Honolulu Advertiser. Retrieved August 28, 2008. ^ "Fulfilling the President's Vision for the Northwestern Hawaiian Islands Marine National Monument" (PDF) (Press release). Council on Environmental Quality. March 2, 2007. Archived from the original (PDF) on September 10, 2008. Retrieved August 28, 2008. ^ "Secretary Kempthorne Joins Mrs. Laura Bush in Announcing Papahānaumokuākea Marine National Monument" (Press release). U.S. Department of the Interior. March 2, 2007. Archived from the original on October 21, 2007. Retrieved August 28, 2008. ^ "President's Statement on Advancing U.S. Interests in the World's Oceans" (Press release). Office of the Press Secretary. May 15, 2007. Retrieved August 30, 2008. ^ "DOI Secretary Kempthorne Selects New U.S. World Heritage Tentative List" (Press release). National Park Service. January 22, 2008. Retrieved August 26, 2008. See also: "Papahanaumokuakea Marine National Monument". Tentative Lists Database. UNESCO World Heritage Centre. January 30, 2008. Retrieved August 30, 2008. ^ UNESCO World Heritage Centre. "UNESCO World Heritage Centre – World Heritage Committee inscribes two new sites on World Heritage List". unesco.org. ^ Centre, UNESCO World Heritage. "World Heritage Committee inscribes two new sites on World Heritage List". unesco.org. Retrieved September 3, 2016. ^ Kubota, Gary T. (August 21, 2010). "Sea temperature rise prompts coral watch". Hawaii Star-Adverstiser. Retrieved August 26, 2016. ^ "Waikīkī Aquarium » Coral Programs". www.waikikiaquarium.org. Retrieved August 27, 2016. "Library". Papahānaumokuākea Marine National Monument. National Marine Sanctuaries Program. 2008. Archived from the original on March 10, 2008. Retrieved September 3, 2008. Wikimedia Commons has media related to Papahānaumokuākea Marine National Monument. "Aloha! Welcome to Papahānaumokuākea Marine National Monument – where nature and culture are one". papahanaumokuakea.gov. Papahānaumokuākea Marine National Monument. Retrieved August 27, 2016. Papahanaumokuakea.gov: Official Papahānaumokuākea Marine National Monument Discovery Center website — homepage + links. USFWS: Flickr: FWS photo gallery — Papahānaumokuākea Marine National Monument images.